Shayne Pierre receives his Montana Highway Patrol Colonel’s Award for Meritorious Service from Montana Highway Patrol Major Steve Lavin. Shayne Pierre and his mother Francine, holding baby sister Elizabeth Mary, look at Shayne’s award. 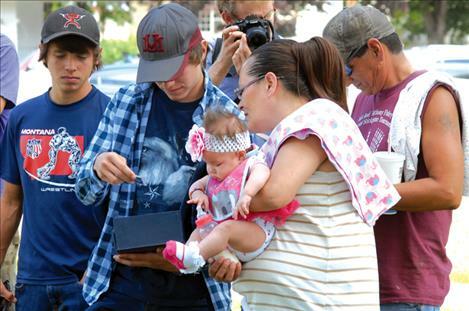 POLSON — Under the cool shade trees on the Polson Courthouse lawn, Shayne Pierre stood with a group of law enforcement officers — at age 15, he was a few years younger than any of the other men. 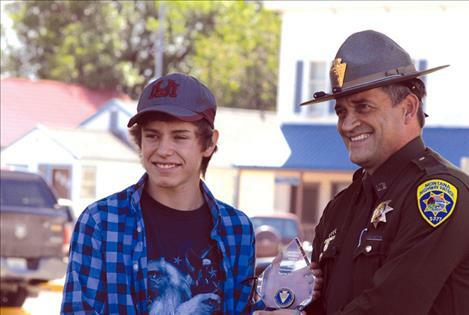 Shayne was there July 13 to receive the Colonel’s Award for Meritorious Service from the Montana Highway Patrol. 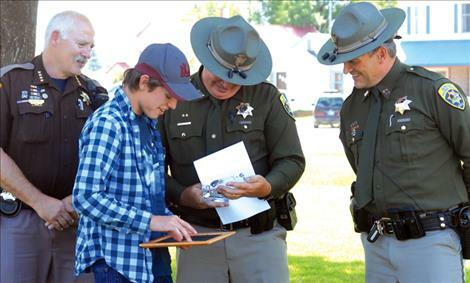 Trooper Terry Rosenbaum nominated Shayne for the award because of the way Shayne reacted quickly and helped others when the school bus he was riding was involved in a wreck on Highway 35 near Fulkerson’s Corner on May 11. 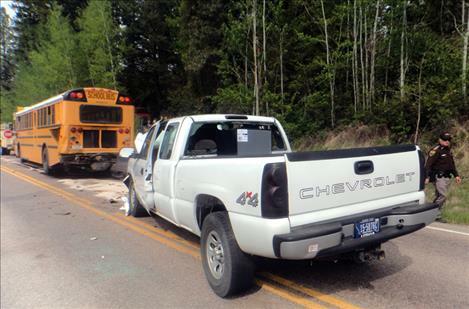 Shayne was on his way home from school, asleep on the school bus when a pickup hit the vehicle. The impact of the crash woke him up. “I looked up, and there were kids screaming,” he said. Shayne’s little brother Isaac, 8, was also on the bus. Shayne was already assessing the crash site. Looking out the bus’s back window, he saw that the pickup driver was hurt. He rushed outside, realized oil and gas were leaking from the bus, went back inside to alert the bus driver to get the kids off the bus. Then Shayne went back to render aid to the pickup driver. Shayne and Isaac’s dad, Rene, was behind the bus, heading home to Yellow Bay. 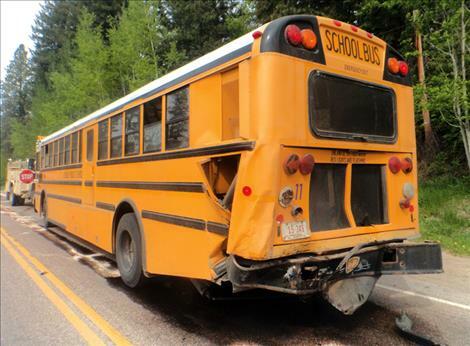 Two school buses run on the east shore, and Rene was dismayed to realize his children were on the wrecked bus. In the aftermath of the wreck, Shayne and two other kids were transported to the hospital. One of the kids had a concussion and the other some cuts and bruises. Trooper Rosenbaum talked to him at the hospital. 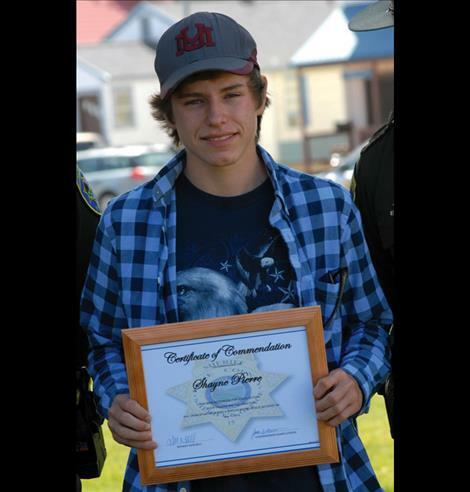 “Shayne made it sound like it was no big deal, he was very humble,” Trooper Rosenbaum said. The Colonel’s Award is not awarded frequently, according to Montana Highway Patrol Sergeant Rich Salois. “Not just anyone gets one,” Sergeant Salois said. 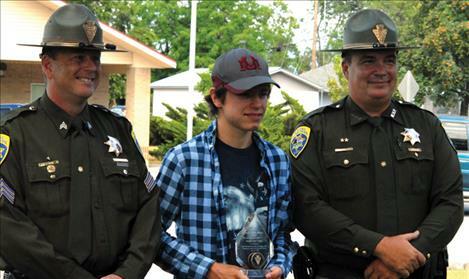 Montana Highway Patrol Major Steve Lavin presented the award to Shayne. “I’ve been in the Montana Highway Patrol for 23 years, and this is the first one I’ve been involved in presenting,” Major Lavin said. 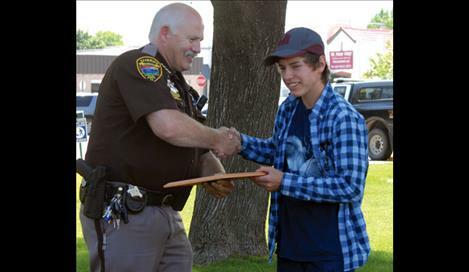 Lake County Sheriff Don Bell presented Shayne with a commendation and a challenge coin. Shayne’s family was out in force — his parents, Rene and Francine, baby sister Elizabeth Mary and brother Isaac, grandmothers, aunts and uncles and friends — to applaud his bravery and his awards.